Shepherd's Notes. Placed at the end of each section, a capsule statement provides the reader with the essence of the message of that section. Old Testament Reference. Used when the writer refers to Old Testament passages or when Old Testament passages illuminate a text. New Testament Reference. Used when the writer refers to New Testament passages that are related to or have a bearing on the passage's understanding or interpretation. Historical Background. To indicate historical, cultural, geographical, or biographical information that sheds light on the understanding or interpretation of a passage. Personal Application. Used when the text provides a personal or universal application of truth. Word Picture. Indicates that the meaning of a specific word or phrase is illustrated so as to shed light on it. Winfried Corduan, ed. 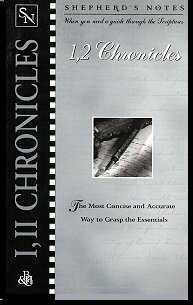 *, Shepherd's Notes: 1 & 2 Chronicles. Broadman & Holman, 1998. Shepherd's Notes is a series on all of the books of the Bible that gives you a quick, easy access to the Bible--one book at a time. Whether you're involved in a bible study group, teaching, or simply getting personally acquainted with history's greatest literary collection, you'll find Shepherd's Notes deliver the essentials of each book in succinct, easy-to-digest bites. With Shepherd's Notes as your guide, you'll grow in your confidence to discuss biblical themes and details with your friends and colleagues. Here's how easy Shepherd's Notes are to use: Simply read the entire book or search for the specific chapters of the book that you are interested in. I enjoyed writing in the area of biblical studies at the time, not having any idea that a few years later I would write an entire book-length commentary on 1 and 2 Chronicles. *Being the "editor" of this volume actually meant writing the text as well as preparing the charts and helps.